Today, there are many changes that have come in the recruiting process, from resume to interviews. In this age of social media, resumes are undergoing a lot of changes. Resumes need to be prepared with lot of skill and thought because it is your gateway to an interview and hopefully the job. Hence special care needs to be taken to ensure that your resume stands out from the hundreds of resumes and that it succeeds in convincing your employer that you are indeed a suitable candidate for the post. Since, today, the conventional resumes do not work anymore, new rules of resume writing have come into being. Here we are going to discuss tips to build a great resume. A common line found in most of the resumes is the objective line. This is a passe for today’s resumes. So, do away with this objective line completely. How will you like if newspaper stories, short stories, articles, novels, etc., do not come with a headline? You would want to know what is in there before you start reading it, right? The same rule applies to resumes too. Hence one of the new rules of resume writing is to give a headline to the resume. For example, a marketing manager’s resume should have a headline as ‘Senior Marketing Manager’. Just after the title, write in brief what you are capable of, so that in the first few lines itself, your resume catches the attention of your future employer. Here, you can mention the highest targets achieved as a marketing manager or mention a prestigious project you have handled in your previous job. The above two points give a great start to your resume and tells what you are great at and about your fine qualities that make you the best candidate for the job. Earlier adjectives like dynamic, visionary, hard working, etc., were a necessary part of resumes. But as per the new rules, these phrases are passé now. Hence, refrain from using these words. Use the tight writing style and be direct to the point. For example, in a marketing manager’s resume, you can say that ‘charged to promote business and spread in new areas’ or something that says what you wish to do or what you are capable and confident of. Here you do not say that it is your objective but you directly write that you are able to do it. There are some duties that are the normal tasks for a post. For example, a marketing manager is expected to do presentations, be in-charge of a team, etc. The new rules advise you not to state the obvious. Hence, ensure that your resume does not list the regular duties or responsibilities. For example, in a writer’s resume, she should not say, ‘ensuring error free writing’ because it is her main responsibility as a writer to write articles without errors and mistakes. Thus, such duties that are obvious ones need not be mentioned. As per the new rules of resume writing, the Harvard Format should be a necessary inclusion. As per the format, you should have two separate sections for responsibilities and achievements. The former should be mentioned in paragraphs while bullet points should be used to list each achievement of yours. This makes it easier for the employers and better for you because this format draws quick attention of your employers and increases your chance for an interview. 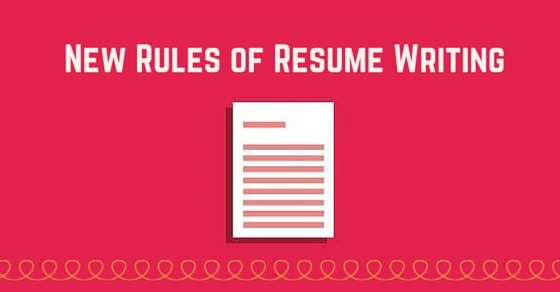 The new rule for resume is that your resume needn’t be just one page. But just ensure that your resume narrates a gripping tale and can be read easily and quickly. Your resume should work as a great advertisement that can ‘sell’ your abilities effectively. At the same time, do not make it your biography. You needn’t mention each and every task you have undertaken, that is the new rule. Just give a good perspective so that they are compelled to give you an interview. That’s all! When it comes to achievements, you should list only those which are relevant to the post you have applied for. For example, if you are applying for a marketing manager’s post, then your typing speed and computer skills are not that relevant but if it is a secretary or a writer’s post that you are seeking, then these talents do count. But at the same time, a candidate’s oratory skills or the prizes he or she has won in debating competitions are worth mentioning both in a writer’s and a marketing manager’s resume but not essentially necessary for an engineer’s or technician’s resume. So, think what achievements of yours fit in best with the role you are applying for and mention accordingly. Giving a number often works because it is the best and quickest way to tell your achievements. A marketing manager can say that ‘achieved 60% of the revenue goal for the fiscal year’ and this gives a good ideas about his accomplishment. Stating a percentage along with a figure helps because it also quickly sums up your achievements. No need to look further. In this age of social media, it is not surprising that the new rule of resume writing is to include your LinkedIn profile. But, before you do so, ensure that you have a great profile and you have listed all that you have meticulously and you have good connections and recommendations. This profile should support your resume, remember that. This is the new rule. Do not waste the precious space in the resume by listing and writing unnecessary information. References, etc., might not be necessary at this stage. Put up the best information up front and that’s a rule all the time. More relevant the information, higher its placement in the resume, that’s the rule. This is an all-time favourite rule and hence an important aspect for resume writing. Avoid words such as ‘I, we, our’. Also, it is better not to write in full sentences when it comes to stating responsibilities and achievements. Instead of writing’ ‘I was in-charge of the marketing strategy of X product’, you should say, ‘spearheaded the campaign for the marketing of X product’, that’s more effective. A universal truth about resumes, if you like it or not, is that they are not read but only glanced through. There are chances that a person who is assigned to select the best resumes out of hundreds may just a junior level person who is not even aware of the job responsibilities of the applicant. These people are asked to look for certain words in the resume and choose accordingly. Hence use keywords wherever you can. You should go through different job descriptions for the post you have applied and also look at the website of the company where you are applying. You will find that there are some words that are common in all of these. These are your keywords. As per the new rule, a two-page resume is good enough but ensure that all your information is put in a brief style and is not elaborate. You need not include each and every detail about your career. For example, information about an internship is good to be included in a fresher’s resume but it is not relevant for a person with experience. Hence, edit and re-edit your resume, that’s the new rule. Your confidence should come through your resume. Boast of your achievements, but do not go overboard so to appear arrogant. That’s a thin line there. The new-age rule is ‘show off’ what you have. Thus, make it a point to showcase with pride your accomplishments and communicate confidently. This is one rule that stays all time. Check your font size, it should not be too small and your employer will have to use a magnifying glass to read it and neither should be the font too big that your resume prints to more than four pages or so. Use bold and italic fonts but limitedly. There should be enough white space in your resume to give it a neat appearance. Even if you are sending your resume via e-mail, keep a print version ready because you may be asked to carry a copy with you for the interview. Hence, ensure that you are using a good printer, that’s an evergreen rule. This is a rule that was for yesterday’s resume, this is a rule for today’s resume and this rule will hold true for future resumes as well. No matter what post you are applying for, typographical mistakes, grammatical errors and misspelled words are a strict no-no. Such silly mistakes give an impression that you are a lazy and uncaring candidate, qualities which are misfits for all posts and all companies. As times change, rules change and this is a fact for any business and any field. Resume writing is no different. In today’s era of technology, social media and high competition, resumes have to put in a new appearance. The content needs to be changed accordingly, so is the order of the content. The above 20 rules will help you draft a resume that is in with today’s time and help your resume to stand out and give you a good chance of landing that interview. After all, isn’t that the sole purpose of a resume? Incorporate the above 20 rules in your resume as fast as you can. Next articleHow to Prepare for Second Round Interview?